Don’t let the name Disney at the top of the poster fool you, Into the Woods isn’t little kid stuff. But it is more evidence that Rob Marshall is the guy who should be directing your next musical. After nearly thirty years, the Tony-award winner from Stephen Sondheim (music) and James Lapine (book/screenplay) makes it to the big screen. It’s more lean, less mean, and still pretty spectacular. 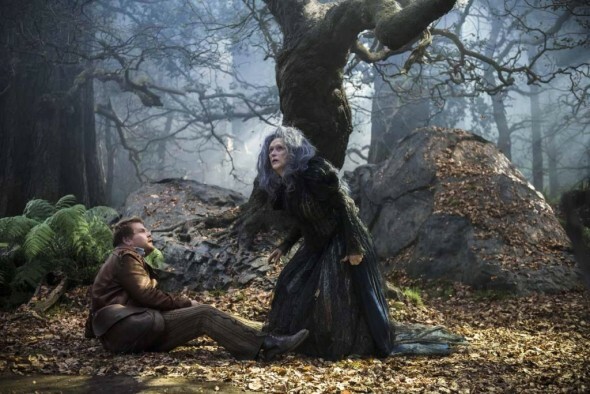 Having Meryl Streep at the top of your cast list is always a wise move, and she’s utterly commanding as a Witch who offers the village Baker (James Corden) and his wife (Emily Blunt) a mysterious deal. In exchange for a few magical items (red cape, white cow, yellow hair and golden slipper), the Witch will reverse a curse that is keeping the couple childless. As the Bakers head into the woods to begin their search, four classic fairy tales begin an enchanting intersection. With the benefit of a live stage, Cinderella, Rapunzel, Red Riding Hood, Jack and his beanstalk could take turns in the spotlight while still keeping a combined narrative intact. A screen version presents an inherent challenge to recreate that vision, but Marshall doesn’t shrink from it. His camera is almost always moving, with wide aerial shots showcasing everyone’s place in the woods, and slow pans that glide easily from one fairy tale to the next. While Marshall’s Nine was more a series of dazzling parts, here he’s able to sustain the realization that each storyline in the woods is connected. Marshall is also smart enough to know the material and adjust. The high-stepping pizazz he utilized so well in the Oscar-winning Chicago was a perfect fit for that show, but this is Sondheim. The songs are graceful, poetic, challenging, and Marshall, with a big assist from Dion Beebe’s pristine cinematography, frames them accordingly. The fine ensemble cast follows suit with sharp characterizations. Blunt is excellent (when isn’t she?) as the desperate wife, Corden makes a fine unlikely hero and Anna Kendrick’s Cinderella is..apologies in advance…pitch perfect. Chris Pine makes Prince Charming a delightfully amusing cad while Johnny Depp, as Johnny Depp does, leaves a memorable impression with limited screen time as the Big Bad Wolf. The wee ones may not find any bland theme songs to call their own, but this is family entertainment on a grand, sometimes glorious scale.